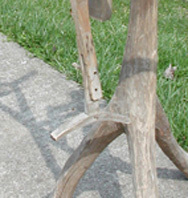 The niddy-noddy is used for make a skein of yarn. 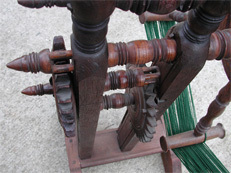 Since old spinning wheels came with only one bobbin, the niddy-noddy is used by the spinner to remove spun thread from her spinning wheel bobbin. She could then resume spinning as the skein was either stored for later use or passed on to a weaver. Weavers require a specific amount of yarn for warping their loom. 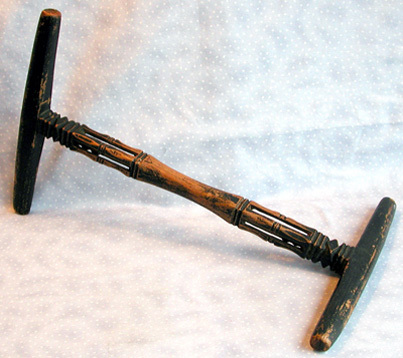 A spinner would use the niddy-noddy to measure how much yarn had been spun. A rhyme could be chanted as the thread was wrapped around the niddy-noddy arms to help keep track of how many wraps were on the niddy-noddy. A yarn skein produced on a niddy-noddy will be somewhat more than twice its length. 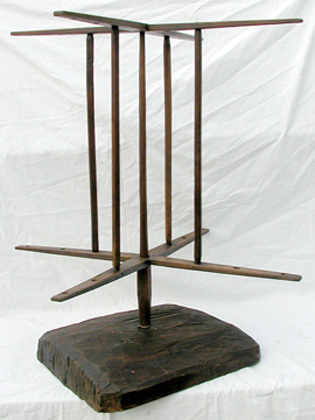 The enlarged view of our niddy-noddy shows hand-carved balls inside a cage. 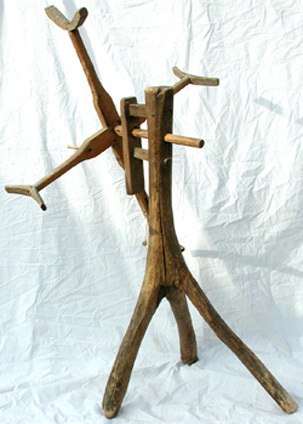 As the niddy-noddy is rocked back and forth the balls tumble and emit a nice rattling sound. When it is desired to remove the skein, means must be provided to collapse one of the hands. The image above shows how the maker of this skeiner handled this problem. The yarn skeiner is used to create a skein of yarn--hence the name. The skeiner is an upgrade of the niddy-noddy. A skein of yarn produced on a winder will be determined by the circumference of the arms. The primitive yarn skeiner above was fabricated by someone probably from a single young tree. 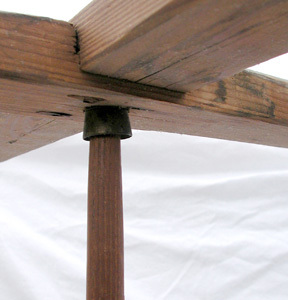 The cross-frame produced by a simple lap-joint is relatively easy to create with basic hand tools. Click Reels are used as a precise unit of measuring spun yarn. First, the clicker must be positioned a the point where it clicked. The wheel is turned which rotates a screw. 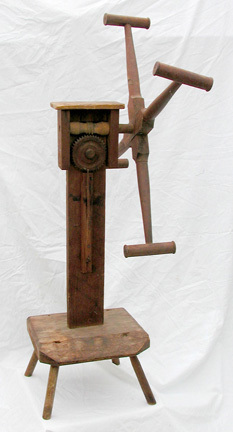 The screw turns until the gear makes a complete revolution at which time a pin on the wheel will let a slim piece of wood to slip over it and make a snapping sound. These skeiners are sometimes called weasels because of the rhyme about "Pop goes the weasel." There seems to be no historic evidence that they were ever called weasels. Note the foreground arm's end is not shaped as the others with a small ridge on each end. This shape enables the skein to be slipped from the click reel. 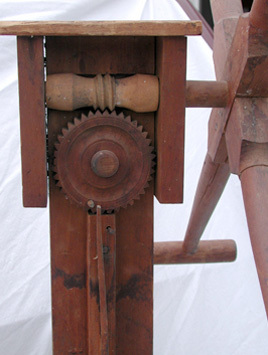 The two shafts have three hand-carved gears. After yarn is spun and measured either on the niddy-noddy or click reel and made into a skein, it can be washed and dyed. 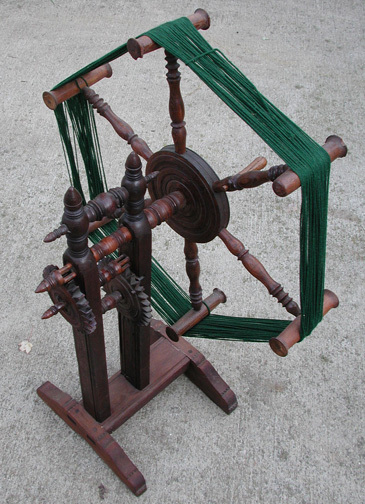 A swift is used to hold the skein of yarn while it is wound onto bobbins or spools, or even wound into a ball. Since there is lateral tugging on the swift, they are weighted down to prevent tipping over. Notice the large piece of solid wood used as a base. 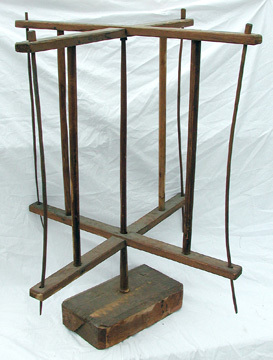 The cross-frame swift below shows a brass cup on top of the spindle which would act like a bearing and reduce wear. This graceful swift shows what can be made by hand when it is necessary. The four ribs below clearly were whittled from sticks. They have a larger end which acts as a stop when the rib is dropped through its hole. To aid in putting a skein of yarn around the swift, a rib would be removed and then slid into place.